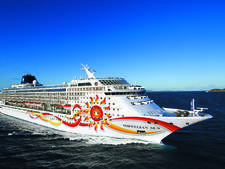 Norwegian Joy will relocate to the United States starting in 2019, beginning with a season of Alaska cruises out of Seattle and followed by a series of Mexican Riviera and Panama Canal sailings. 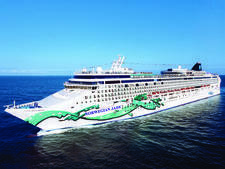 Prior to its arrival in Seattle, Norwegian Joy will undergo an extensive $50 million refurbishment to make it more like Norwegian Bliss. 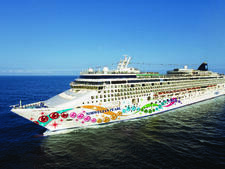 The second ship in Norwegian's Breakaway Plus class, Norwegian Joy debuted in spring 2017. 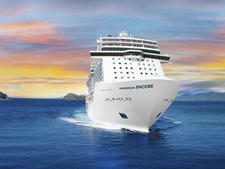 It was purpose-built for the Chinese market and sails in China full time, homeporting in Shanghai and Tianjin (Beijing). 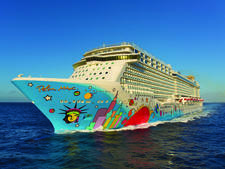 This is the sister ship to Norwegian Escape. 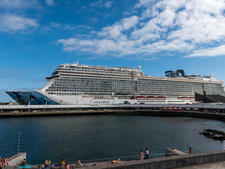 Coming in at 163,000 gross tons, it houses 3,900 passengers with fewer staterooms than its sibling as well as Norwegian's Breakaway and Getaway. 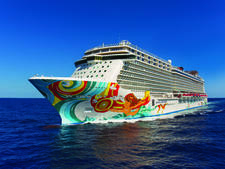 Norwegian Joy was built at Meyer Werft GmbH shipyard in Germany. Originally named Norwegian Bliss, the cruise line changed the ship's moniker when the decision was made to move the vessel to China. 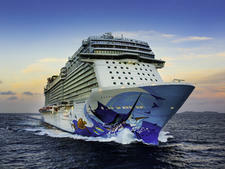 (Sister ship, Norwegian Bliss, which will be Miami and Seattle based, will debut in 2018.) 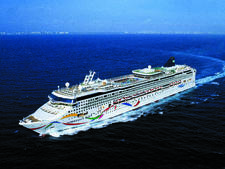 Mandarin is the official language onboard Norwegian Joy. 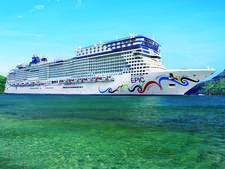 Norwegian debuted a number of brand-new cabin categories onboard Norwegian Joy, and completely removed the Studio (solo) cabin complex, which has been on all its ships since Norwegian Epic. 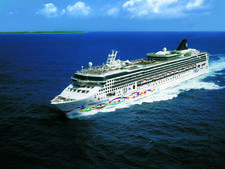 Joy also has more family-friendly suites and rooms with connecting doors than on previous Norwegian ships, to appeal to the Chinese tendency to travel with multiple generations. Ocean View Long Family: One of a number of cabins designed specifically for the Chinese market, this is a large, square-shaped room with a window seat, a bathroom with a tub, acres of closet space and a sofa bed. Family Interconnecting Cabin: These are also new to Norwegian and include three rooms: a master bedroom with a bathroom with tub; a living area with a sofa; and a second bedroom, complete with shower room. The big wow: a virtual balcony in the living room, playing real-time views of the ocean. Junior Suite: This category has two separate rooms, and includes coffee-making facilities, a bathroom with tub and Hermes products, as well as a separate shower room. Concierge Level (Decks 14 & 15): A new accommodations category unique to Joy is located directly below The Haven. 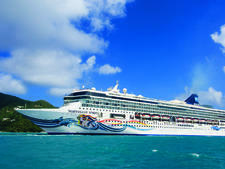 Although this category is not as luxurious as The Haven, passengers enjoy a number of extra perks. The cabins are square-shaped, with a walk-in wardrobe, small sitting area and a large desktop that stretches across one side of the room. These cabins also have a large, deep balcony, with room enough for two loungers and a small table. Concierge Level also includes a new interior suite class with two bedrooms and a simulated balcony; access to a concierge and to an exclusive Concierge Lounge with a private bar and refreshments and double height floor-to-ceiling windows, which really are breathtaking (this will become the open-to-all Observation Lounge on Norwegian Bliss, as the new ship will have no Concierge Level). Concierge Level cabins have the same forward views as The Haven. 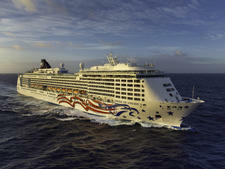 The Haven (Decks 17, 18 & 19): Norwegian's signature ship-within-a-ship concept is the biggest on a Norwegian ship yet. The Haven is keycard accessible only, with butler service, a dedicated concierge, priority access to specialty dining and entertainment, a private restaurant and an enclosed courtyard with a swimming pool and hot tubs. It also has its own high-rollers casino. There are slightly fewer suites in Joy's Haven, 74, as opposed to the 95 on Escape. On Joy, The Haven also includes a brand-new Observation Deck with the same view that ship officers experience from the bridge, as well as gourmet canapes and premium beverages. Joy has 29 restaurants onboard. Savor and Taste (Deck 6): Situated opposite each other, these complimentary restaurants are the nearest Norwegian comes to a main dining room. Both serve traditional and fusion Chinese cuisine with Korean and Japanese accents. 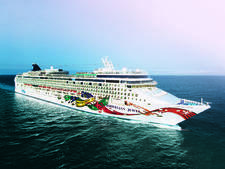 Manhattan Room (Deck 7): Just like the line's Breakaway-class ships, Norwegian Joy has a Manhattan Room; the new ship's version, however, has a wide selection of Chinese cuisine complemented by Western-style classics such as steaks and seafood. 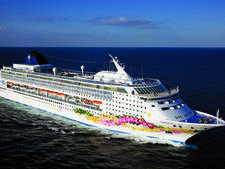 Garden Cafe (Deck 16): The ship's buffet offers breakfast, lunch and dinner with Chinese and Western classic menu items, as well as food stations. Teppanyaki (Deck 6): Teppanyaki is Norwegian's Japanese hibachi restaurant. Sakura & Hibiscus (Deck 6): These new-to-the-line restaurants give diners the option to prepare their own meal in Korean hot pots or at a traditional Korean barbecue table. Food Republic (Deck 8): This dining venue made its debut on Norwegian Escape and was a big hit, serving up foods in sharing style from across the world. The emphasis here is inevitably on Asian cuisine. Cagney's Steakhouse (Deck 8): A Norwegian favorite, Cagney's is a traditional chop house featuring premium cuts of meat. La Cucina (Deck 8): The line's Italian restaurant. Le Bistro (Deck 8): Le Bistro is the line's French restaurant. Neptune's (Deck 8): This replaces Moderno Churrascaria on other Norwegian ships and features a buffet of fresh seafood, both chilled and raw on ice, and an a la carte menu. The Bake Shop (Deck 8): This boutique bakery sells cupcakes, macarons, chocolate pralines and Japanese mocha sweets. American Diner (Deck 17): As the name suggests, this serves American comfort food, such as meatloaf, pot pies, burgers and fried chicken. Noodle Bar (Deck 17): Serves fresh noodles and dim sum. Atrium Bar (Deck 6): A large bar in the main atrium. Mixx Bar (Deck 6): Cocktail bar for upscale cocktails and wines. Joy Tea Room (Deck 7): This replaces Norwegian mainstay, O'Sheehan's, and is dedicated to tea and snacks. Skyline Bar (Deck 7): The casino bar. Le Cave (Deck 8): Making its debut on Joy, this upscale wine bar is for wine tasting and pairings, or a pre-dinner drink. The Grand Tea Room (Deck 8): This high-end tea room serves a wide selection of teas and finger foods, and offers a traditional afternoon tea service. Humidor (Deck 8): The ship's indoor smoking lounge. Prime Meridian (Deck 8): Located between Cagney's Steakhouse and Neptune's. Waves (Deck 16): Poolside bar. Spice H20 (Deck 17): An adult-only outdoor bar inspired by Ibiza, but with Asian influences. American Diner Bar (Deck 17): This American-influenced bar serves a wide selection of beer as part of the restaurant. VIBE (Deck 19): This 18s-and-over beach club-style bar features loungers and hot tubs and is accessible via a limited number of daily guest passes. The Joy Theater (Deck 7): This theater features two shows: Paradis, inspired by a Moulin Rouge-style Parisian club; and Elements, a revue-type show with music, dance and acrobatics. Karaoke Rooms (Deck 6): The ship has eight private karaoke rooms, which can accommodate groups of four to eight people for a fee. Casino (Deck 7): A huge casino -- the largest in the fleet -- takes up most of Deck 7. There is a VIP Casino, for high rollers, on the deck below, which also serves food. Galaxy Pavilion (Deck 16): A new area for games and virtual reality simulators features hovercraft bumper cars, a state-of-the-art racing simulator, three interactive dark ride simulators (where you appear to be riding a roller coaster in the dark), a Star Wars battle pods video game, six Xbox console stations and Oculus, a virtual reality game, as well as a 4D cinema and a simulated hang glider. Serenity Park (Deck 16): One of the big changes onboard Joy -- compared to other Norwegian ships -- is on the main pool deck. Norwegian conducted extensive research among Chinese passengers, and the consensus was they placed more value on an area in which to walk, rest under shade (in the form of plastic trees) and practice tai chi or yoga. So the pool itself has been pushed to one side, and most of the deck is given over to the approximation of a park (with fake grass). There are also very few loungers, as the Chinese don't sunbathe. The only downside to the "Serenity" Park is the Kids' Aqua Park is in the same area. Aqua Park (Deck 17): The park boasts two multistory water slides. The Double Aqua Loop free fall slide has two loops, one that extends over the side of the ship and one that is see-through. The Aqua Racer slide allows passengers to race side-by-side on inner tubes for more than 360 feet. Race Track (Decks 18 & 19): A two-level competitive racetrack, the first at sea. Ten passengers race each other in electric carts over a split-level course (lasting five or six minutes) at the aft of the ship, and have photos taken at the end. Rock Climbing Wall (Deck 19): Two-level rock climbing wall. Laser Battle (Deck 20): A for-fee open-air laser tag course, on what is the top deck Sun Deck on the other Breakaway Class ships. 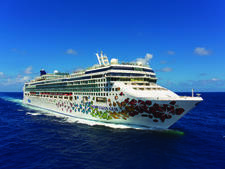 An upscale shopping venue, the largest in Norwegian's fleet takes up most of Deck 8. It features more than 50 high-end brands including Cartier, TAG Heuer, Omega, Bulgari, Rolex and Calvin Klein, as well as duty free and a logo shop, among many others. There is a chess and card room on Deck 6. The Mandara Spa (Deck 16) has hot tubs, a Finnish sauna, steam room and thalassotherapy pool as well as several treatment rooms. Treatments on offer include reflexology, acupuncture and a range of massages and beauty treatments such as manicures and pedicures. The Pulse Fitness center offers classes like indoor cycling, step aerobics, Zumba, yoga and Pilates. There is also a running track on Deck 17. Much of Deck 5 is given over to the huge Splash Academy, which caters for kids from ages 3 to 12-years-old. They'll learn to juggle during circus workshops, play plenty of sports and enjoy a wide variety of other fun activities. The only downside: it's deep in the bowels of the ship and enjoys no natural light.